Raymond Benson, who wrote several James Bond continuation novels, looks back at the two film versions of Ernest Hemingway's great crime story The Killers at cinemaretro.com. The Criterion Collection gave us the DVD versions of these two excellent crime thrillers twelve years ago. The company has now seen fit to upgrade the release to Blu-ray. 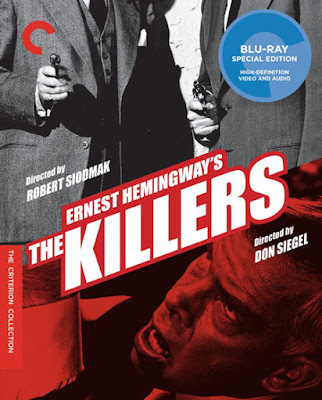 Based loosely on a short story by Ernest Hemingway, both versions of The Killers begin with the author’s premise and then take off from there in very different directions. It’s interesting to see how the respective screenwriters adapted the story and then created two disparate feature-length tales out of it. In Hemingway’s piece, two hit men arrive in a small town looking for “the Swede.” They terrorize the owner, cook, and a customer in a diner in an attempt to find the guy. After the killers leave in frustration, the customer runs to the Swede’s boarding house and finds him in bed with his clothes on. He warns the Swede about the men, but the Swede says he’s not going to do anything about it. The customer goes back to the diner and, after realizing no one cares, leaves town. And that’s it. The 1946 version faithfully captures the short story—even down to the dialogue—for the first ten minutes. Where the short story ends, the movie goes on and we see the hit men actually kill the Swede (played by Burt Lancaster in his first starring role). Enter Jim Reardon (Edmond O’Brien, with third billing, but he’s really the protagonist of the film!) as an insurance inspector—it turns out the Swede had a life insurance policy that benefits an old lady who helped him once. Reardon is determined to uncover the story behind it all, and the rest of the movie follows his investigation into the Swede’s life in crime (told entirely in flashbacks). The Swede was a boxer who got mixed up with Big Jim, a racketeer (played by Albert Dekker), and falls in love with Big Jim’s gal, Kitty (played by smokin’ hot Ava Gardner, in one of her first starring roles; Gardner had been kicking around Hollywood since the early 40s—this was her big break). As we all know, it’s not good to mess around with the crime boss’s dame. ... The 1964 version is a different animal. It was produced to be the very first TV movie, but NBC viewed the finished product and deemed it too violent for television. Instead, the producers released it theatrically worldwide. Directed by Don Siegel (billed as “Donald Siegel”), The Killers Mach II stars Lee Marvin and Clu Gulager as the hitmen, who here become the focal point of the new story. John Cassavetes plays the Swede character, only here he is a racecar driver named Johnny. The femme fatale, Sheila, is played by Angie Dickinson, and get this... the crime boss is none other than Ronald Reagan in his last film role before he became a politician. Sorry, but I have no patience for the film versions; give me Hemingway's words over filmed images all the time. But I nevertheless enjoy your posting, especially as it reminds me that I would like to reread Hemingway's stories, novels, and nonfiction. The man was a mess, but his writing was often brilliant. Hemingway also did not care for the films based on his stories. Yes, Hemingway had many personal faults, but I believe he was a great writer. I like his short stories better than his novels, and 'The Killers' is on of his best short stories.